I drove 400 miles to see a portion of The Names Project, the sections of quilt panels made by the loved ones of persons who died from AIDS-related illnesses, at the MSU field house in Bozeman, MT, in the early 90's. If viewing this doesn't move one to tears, I don't know what will. I read the book at the local library, which is a beautiful display of some of the panels, stories, and the history of the Names Project. The documentary, "Common Threads" won an Academy Award, and is equally as moving. Today, with medicine and better identification and less stigma, many fewer people are dying of AIDS, however, the spread of HIV is still out of control in Africa. 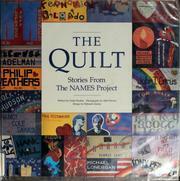 Stories of the people who are memorialized on the Names Project Quilt who have died from AIDS. Also, "Letters from the Quilt" broke my heart. I can't find a copy of that book, but it is heartbreakingly beautiful. Just found this for $2 from Goodwill, looks like a great coffee table book.